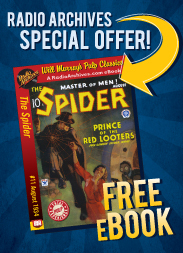 Meet the Spider — master of men! More just than the Law... more dangerous than the Underworld. Hated, wanted, feared by both! Alone and desperate, he wages deadly, one-man war against the super-criminal whose long-planned crime-coup will snuff a thousand lives! Can the Spider prevent this slaughter of innocents? The author chosen to pen the first Spider tale was a famous mystery and suspense novelist whose preferred byline was R. T. M. Scott. More than a dozen years before, Scott became famous for his stories and novels featuring Secret Service Smith, a government agent who later became a consulting detective for hire. It's clear that Scott modeled this new hero for the Depression generation after his previous protagonist. The Spider Strikes establishes the essentials of this exciting series. Richard Wentworth is reckless, cold-blooded, and perfectly willing to play dangerous game between the law who seeks his capture and the enemies of the law he is sworn to track down. While his motivations are unclear, his single-minded determination is without question. He is a hunter of criminals, and in his debut novel he becomes a hunter of supercriminals in the form of the mysterious Mr. X.
Nick Santa Maria brings the action to electrifying life. Originally published in The Spider magazine, October, 1933. Chapter 21: The Spider Amuck! While he may have never had his own OTR program, the Spider is stil a fondly remembered Pulp character, and while he may have been a rival to the Shadow he stands side by side with him today as iconic as a pulp hero can be. This may not be a remastered radio program, but it certainly plays like one. The narration is fantastic, and Santa Maria captures the tone of those golden days of radio. He most certainly has a nice noir quality in his reading. If you know the Spider at all then you will enjoy this audiobook. The quality is outstanding and the action will entangle you in a web of intrigue. This is pure pulp at its finest.